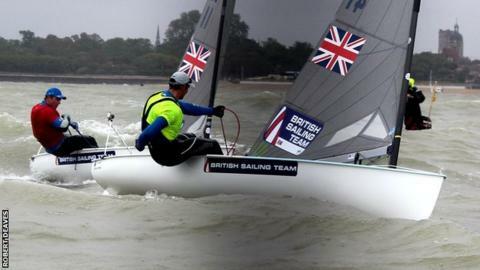 Britain's Giles Scott secured Finn gold and compatriot Ed Wright took bronze at the European Championship in La Rochelle, France. Scott, 26, won gold with a day to spare after finishing 15th and eighth in Friday's two races to build an unassailable 34-point lead going into Saturday's 10-boat medal race. Wright, 36, joined him on the podium with a sixth-place finish on Saturday. Scott finished off his regatta in style with his seventh win from 11 races. He maintains his unbeaten run in regattas since returning to full-time Olympic Classes sailing in September. "I'm most happy about this from all the events I've won since I've come back," he said. "Last time I sailed in the Europeans was in 2011 when I won it, so it's nice to come back and still be able to do it in the big fleets and at the big events." Scott's victory on Friday came on the first anniversary of British Olympian Andrew Simpson's death during a training session for the America's Cup in San Francisco Bay. "The Finn sailors and officials all gathered at 9am this morning and [jury chairman] John Doerr said some very nice, emotional words and we had a minute's silence," said Portland-based Scott. "It was a fitting way to remember 'Bart'. He was a bit of a counsellor to me - he'd offer his advice and I'd always take it on board. As everyone knows he was seen as a pretty wise man."